When gathering your party decoration supplies you can display your amazing decorating skills with this white and gold polka-dot Mylar foil balloon. With its round shape and black Happy Engagement script it makes a cute and unique addition to any party, especially as the centerpiece of your arrangements. 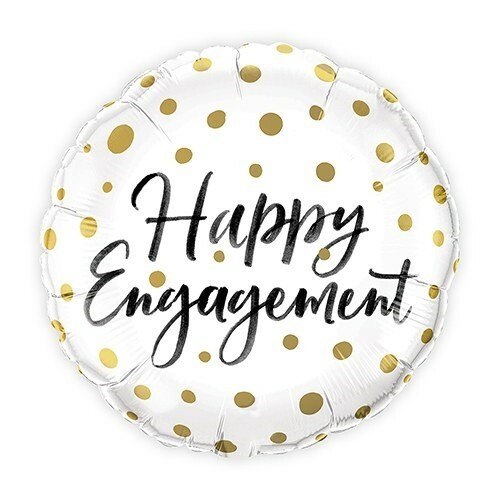 Pair it with the polka-dotted Mr. and Mrs. or Happily Ever After Balloons to keep with your theme. Balloons are a cheap and easy way to customize all sorts of celebrations like wedding receptions, engagement parties, baby or bridal showers, anniversaries, retirements, graduations, and birthdays. Bring to life the thoughtful design ideas and vision behind your chosen specialty party theme making you and your party goers happy. The novelty of the balloon will never fade and when this simple white polka-dotted round Mylar foil balloon is filled with helium it can add just the right note of style or class to your party room's décor or balloon bouquet.